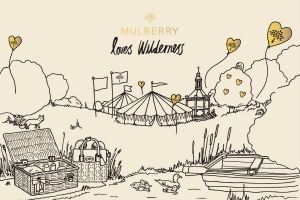 British accessories company Mulberry has revealed plans to host a branded tent and private walled garden at this year's Wilderness festival (8-10 August). The activation will centre on a series of ‘Mulberry loves craft’ events, now sold out, which will give festival-goers the chance to meet two of the brand’s craftsmen and learn how its famous Bayswater bag is made. Guests can also design and create their own customised leather bracelets in the tent in 11 workshops planned over the course of the weekend. The activation, which has been planned in-house by Mulberry, will culminate in an exclusive English picnic held on Saturday 9 August inside the garden. The event will be hosted by supermodel Cara Delevingne, who has recently launched a collection with the company. Other VIP guests are also expected to be in attendance.